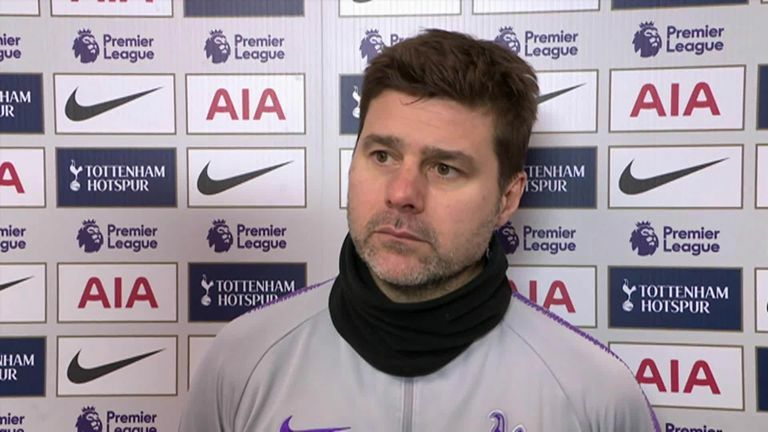 Mauricio Pochettino believes his Spurs squad deserves "massive credit" for staying competitive in the Premier League after a tough period of fixtures. Spurs were knocked out of both the Carabao Cup and FA Cup in January, but won late in the Premier League for the second time in a week as Heung-Min Son's goal gave them a 1-0 victory over Newcastle on Saturday. Pochettino was delighted with the effort his side put in at Wembley, and admits the last few weeks have been difficult to manage in terms of rotation of players. He told Sky Sports: "Our squad deserve massive, massive credit. We are disappointed because of the semi-final of the Carabao Cup, out of the FA Cup to Palace, we arrive at the worst moment for us as it was difficult to rotate and keep the same level in all of the different decisive games. "It's true we were always positive, we fight, but we could not achieve the final or the next stage of the FA Cup, but in the Premier League with two victories against Watford and Newcastle. We are now in a good position, waiting for the Champions League too is very exciting. "A tough game because Newcastle, after they beat Manchester City, were in a good momentum with a lot of energy, more recovery and fresher legs. "We play in the semi-final, play Sunday, play Wednesday and then today, early in the morning, so I think it was tough for us to recover from the efforts. "Fantastic effort, I am so happy with the players, because I think they showed the character we have, so I am so pleased." Pochettino gave an insight into match-winner Son's mentality upon arriving at the club in 2015, saying he had to be patient for his chance, but praised him for being a "key part" of Spurs' success. "I think he's a player who is doing fantastic for us last couple of years," Pochettino added. "His performance, the way he is, he's a key part of the success of today. "It's always difficult for a player like him, from out of England, to adapt, and sometimes you have patience, sometimes none. He was a kid who wanted to play, and with patience and the help of the coaching staff and teammates, he started to show his quality. "At a point he started to feel the love of the people, the club and everyone, felt comfortable and able to show his quality."